There are a lot of variables that factor into the cost of a crown – most notably, what’s involved in the preparation. If you require a root canal prior to getting a crown, that’s going to significantly impact on your bottom line. But for most crowns, you can expect to pay $650 – $1,200. What your dental insurer will cover depends on your individual plan; if you don’t have dental insurance, speak with a member of our staff about our in-house options. The life of a crown often depends on your dental hygiene habits. Unfortunately, crowned teeth are not decay-proof – they are susceptible to fracture and gum disease just like any other tooth, and neglect or stress from clenching or grinding your teeth, biting fingernails, or chewing ice can significantly reduce their lifespan. 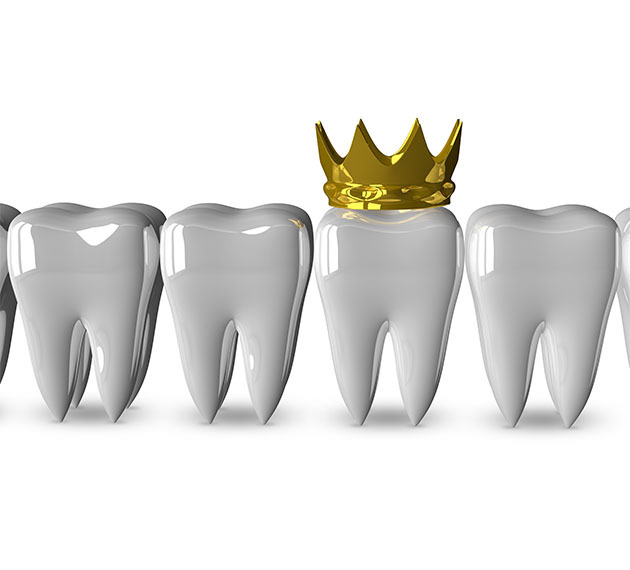 Proper and consistent dental care is the best way to maintain the crown. If you brush and floss regularly and stick to a healthy diet, you can expect your crown to last 5-15 years. Where Can I Get a Dental Crown in Parma Heights? If you think you may need a crown, schedule a visit with Dr. Wolnik in Parma Heights, Ohio, at (440) 888-5055, or book an appointment straight from our website (click on the green “Book an Appointment” button). A crown is a permanent “cap” for a damaged tooth. Crowns are tooth-shaped dental restorations which completely encase a damaged tooth, protecting it from further damage while making it fully functional. Crowns can be made from a variety of materials, but because of their durability and cosmetic appeal, we work with full ceramic, ceramic-over-gold, or all-gold products. Generally speaking, we recommend crowns for clients who don’t have enough original tooth to support a filling, which is often the case when a large, old filling has fallen out. But crowns have other applications, too. If you’re missing a tooth, a crown can be used to fill the gap and give you back your beautiful smile. Likewise, if you have misshapen or permanently discolored teeth, crowns can give you the smile you always wanted. Crowns can also be used with a dental bridge, creating a stable support for the appliance. What’s Involved in Getting a Dental Crown? The procedure begins with the dentist reshaping the tooth by either filing down the enamel or applying a filling to build it up if it is too damaged or decayed. Then a dental impression is taken and sent to a lab that uses it to design and manufacture it. An impression of the surrounding teeth is also taken to ensure that it perfectly integrates with your bite. A temporary crown made of acrylic is placed to protect the tooth until you return. In the past, a permanent crown required 2-3 weeks to be fabricated by an outside manufacturer and required an additional visit to fit the permanent replacement. But thanks to modern technology, we can perform most procedures in a day with our in-house CEREC machine, saving our clients valuable time. This entry was posted in CEREC One-Visit, dental crowns, Dental Services, Dr. Kenneth J. Wolnik, Expert Dental Advice, Frequently Asked Questions, General Dentistry, Tooth Loss and tagged cerec, Dental Costs, Dental Crowns. Bookmark the permalink. Follow any comments here with the RSS feed for this post. Both comments and trackbacks are currently closed.